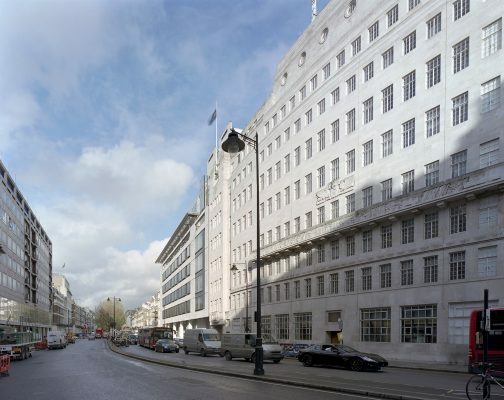 The kernel of the development is the repair and refurbishment of the Grade II* listed 1930’s Headquarters building to provide state-of-art digital broadcasting facilities for the core elements of the BBC’s Radio and Music division. The original headquarters, the first purpose built broadcast building in Britain was designed around radio technology that became obsolete within a decade of the building’s completion. 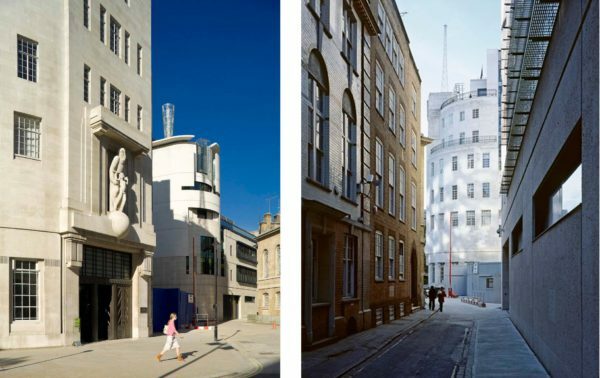 The plan form of the extension responds to Nash’s All Souls Church (Grade I) and creates a major new public space between Broadcasting House and the new wing. 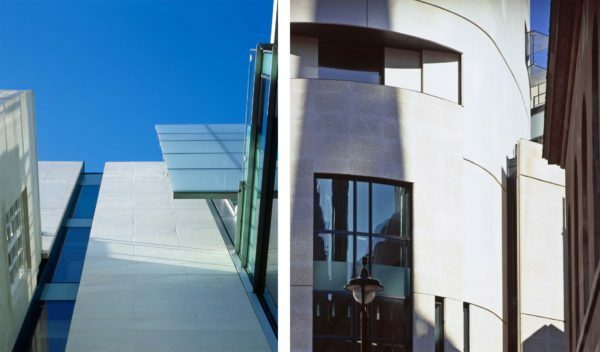 The new elevations complement Broadcasting House using Portland Stone and fritted glass that match the hue of the existing stone. The curved façade of the extension creates a unified backdrop to All Souls Church and a composed termination of the north end of Regent Street. 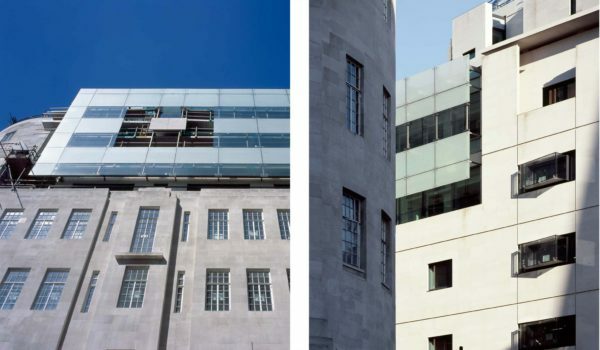 Extensions to the building at roof level provide additional floor area and integrate the original building with the accommodation on the remainder of the site which is to accommodate BBC News and the World Service. The suitability of intervention was guided by our research into the history of the building. Many of the original 1930s interiors were destroyed by WWII air raids and were not reinstated following reoccupation of the building. Changes of requirements with the advance of broadcast technology have resulted in frequent remodelling, particularly of the radio studios. 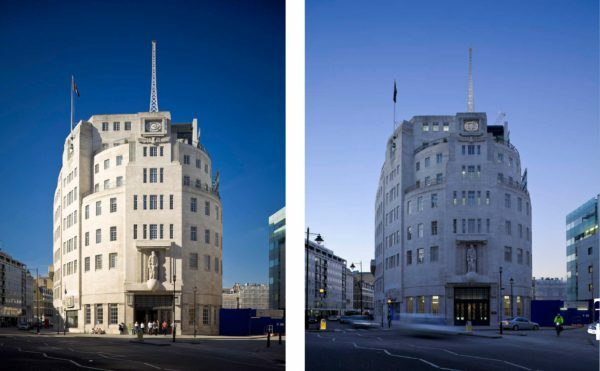 Where the historic fabric has been compromised, we have been able to introduce the highly complex and highly resilient services infrastructure needed to sustain broadcast operations into the future without compromising the essential character of the building. The new modern studios remain in the original location within the masonry tower at the centre of the building and the steel frame accommodation surrounding the tower houses the re-vitalized office space suitable for open plan culture and digital technology. 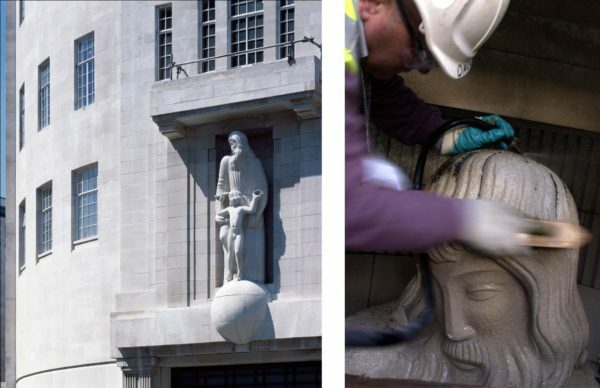 The Portland stone elevations of Broadcasting House have been carefully cleaned and repaired including the Eric Gill Statues. 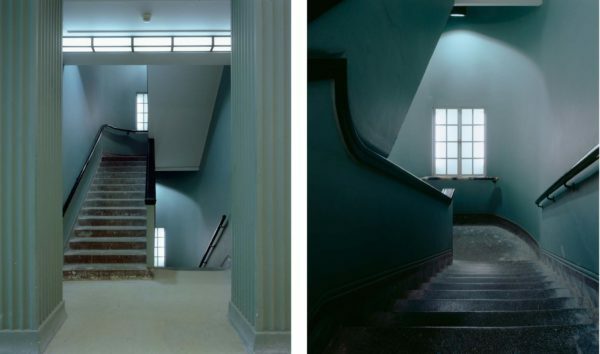 MJP has restored and re-invigorated the building’s major Art Deco spaces: the main reception, and oak panelled Council Chamber and Director General’s suite. The Radio Theatre has been upgraded to discretely accommodate modern radio and television services to meet audience expectations. At the heart of the building is the Radio Theatre, originally the Super Studio and then the Concert Hall, purpose built for the recording and broadcast of instrumental performances where audience accommodation was seen as secondary. 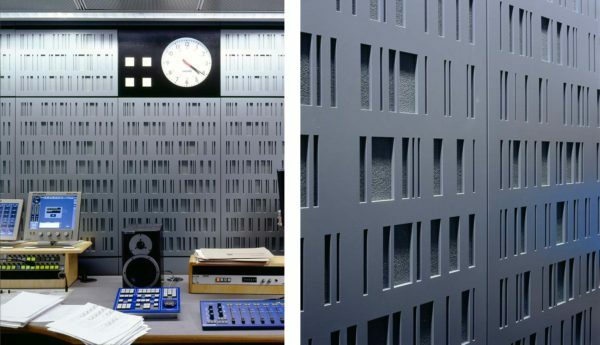 When the Radio Theatre was constructed, public radio service was in its infancy and the BBC was at the forefront of technology meeting the needs of this new medium. While the theatre has constantly been adapted in response to evolving broadcast technology, the stage had changed a number of times to accommodate the orchestra size determined by the prevalent musical taste of the day. Before work started, the Radio Theatre had a number of operational deficiencies, particularly in relation to access and its flexibility to accommodate a large number and variety of performances. We have restored and invigorated the facility, increasing its attractiveness and updating it to current audience expectations, an integral element being to improve access for people with disabilities. The suitability of intervention was informed by our careful historical and archival research into the history of the building. The guiding principle of our approach has been to protect the special architectural and historic character of the art deco interior. The theatre is now equipped for the full range of events envisaged, from light entertainment, through amplified music concerts to conferencing without recourse to the outside supply of temporary rigging. The new stage lifts and lighting rigs permit minimum turn around times that are necessary for its viability and are discretely incorporated. A new state-of-the-art control cubicle is fitted at the rear of the theatre finished in complementary materials. The restored finishes (timber wall panelling which includes the Gilbert Bayes plaster bas reliefs, wall lights and plaster walls with pilasters) conceal the wiring and accommodate patrasses for digital age radio services. A new auditorium rake replaces a previous intervention to allow direct wheelchair access. The general lighting is upgraded and the air conditioning replaced using the original ductwork. 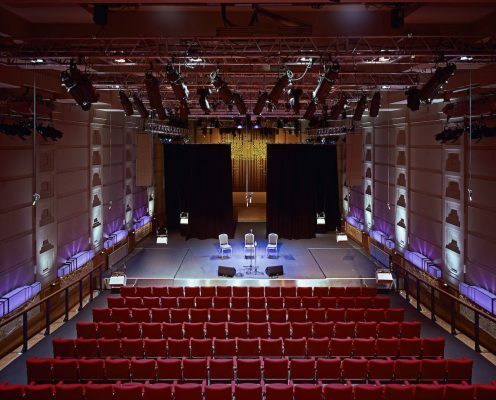 The scheme achieves a successful balance between preserving the special interest of the Radio Theatre and affording the space greater flexibility enabling increased use to sustain public audience broadcast operations into the future.